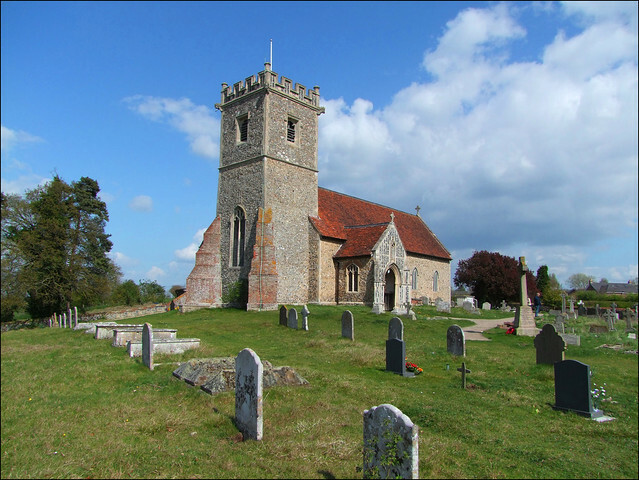 This little hilltop church is one of the most familiar of sights to Suffolk travellers, rising like a small castle to the north of the A14. At one time there was another church, All Saints, in the same churchyard, which would have looked even more dramatic if dual carriageways had existed in those days. But the old church came down after a storm in 1800, and they built a north transept onto St Mary to accomodate the parishioners. When St Mary underwent a large scale and extravagant restoration in the late 19th Century, an aisle was added to the north side, and no trace of the transept remains. For many years, St Mary was difficult of access to passing strangers, but there is now a notice listing keyholders, and I must tell you that I found them very welcoming and friendly. The tower close-up is a fine sight, its bellstage and battlements crisp from their 1885 rebuilding. The chancel was also rebuilt at this time, and you step into what is almost completely a late 19th Century space. The 15th Century font has been moved into the space beneath the tower, as if not to distract from all things late Victorian. But the overwhelming impression is of what is one of the best collections of Kempe & Co glass in all East Anglia. There are figures of Saints, Old Testament Prophets and Patriarchs, and in the north aisle an excellent Annunciation and figures of St George and St Alban which show that the company could still hold its head up in the early decades of the 20th Century. The westernmost window in the north aisle strikes the only dissonant note in this sea of Kempe, and a fine dissonance it is. It an important work by Brian Thomas, depicting the Adoration of the Shepherds. It dates from 1950, an early date for such modernist figurativeness, still looking back to the expressionism of stained glass artists like Leonard Walker, with one eye forward to the Festival of Britain joy and simplicity of the likes of Harry Stammers and Moira Forsythe. The subject is always a powerful one in rural backwaters like Creeting St Mary. At about the same time as Thomas was making this work, he received one of the great stained glass commissions of the second half of the 20th Century, to create a vast scheme of windows for the bombed out church of St Nicholas in Great Yarmouth, the largest parish church in England. To see his work here on such an intimate and human scale is a rare privilege. Stepping back outside, the best feature of the exterior is the excellent 15th Century porch, one of several in this part of central Suffolk. A surprise in it is the Norman doorway, which is perhaps the only survival of the earliest church on this site. A plaque inside the porch records that the modern figure of the Blessed Virgin was given in memory of Canon Harry Fleetwood, who for 45 years never failed to teach the Faith in this church. Fleetwood's infant son, Christopher, is buried beneath a cross to the south of the church. The war memorial outside the porch faces prominently out across the valley of the infant River Gipping, but back inside the church are brass reminders of lives lost in the Great War. One is to two brothers of Harry Fleetwood's wife, William James and Douglas James. Both in their early twenties, they were killed in the hell of the Battle of Loos in September 1915, just five days apart. The Battle of Loos, it will be remembered, was the occasion on which gas was first used, by both sides. Another brass plaque remembers George Groom, an appropriately-named sergeant in the Royal Horse Artillery. He was killed in the even more infamous Battle of the Somme in July 1916, and is buried at Heilly Cemetery near Mericourt l'Abbé to the east of Albert on the Somme battlefield.